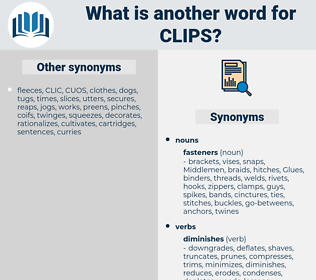 What is another word for Clips? Photos, vignettes, capsule, Capsules, multi-media, taken, media, Shots, untv. 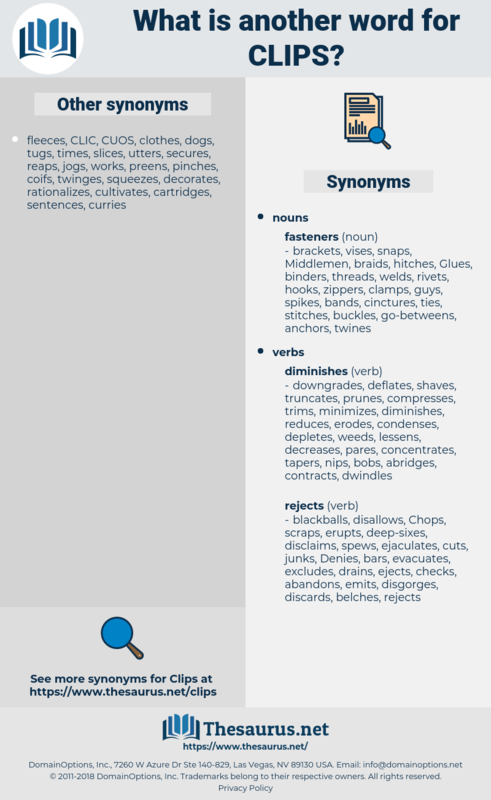 CIPS, pieces, Videotapes, depictions, interruptions, streaming, portrayals, pliers, articles, disconnections, tips, certificates, strips, Grips, calipers, listings, Films, highlights, canisters, denominations, Pincers, connections, timelines, Selections, successions, extractives, Copies, pickups, blackouts, snapshots, molecules, scripts, forceps, scissions, Cartoons, attachments, Extracted, segments, affiliations, connectors, portions, CLAWS, overviews, packages, shippers, braces, slices, chains, stitches, strings, seguros, stretches, vouchers, prints, pins, extractions, Insurances, briefs, samples, papers, vials, PATHWAYS, fragments, bills, Los, consignors, threads, screens, tiles, roll-ups, Magazines, parts, repeats, citations, loaders, Characters, rings, fixings, tethers, exhibits, staples, Tracks, spots, anchorages, screws, patterns, straps, quotes, hooks, finals, midterms, Dailies, bolts, caps, passages, Insurers, Coins, trombones, vestiges, items, readings, BAILS, banknotes, brackets, spreads, cutbacks, Summaries, digests, shreds, outputs, streams, tongs, scenes, PODS, suites, Charges, chargers, ties, kits, outages, Plays, rooms, Tweezers, frames, hits, reaches, movers, Stories, breaks, sides, MAGS, BOMBS, bars, Entries, Parties, Bays, sets, rounds, Photos, vignettes, Capsules, media, safes, Shots. sequence, sequences, videos, sections, songs, MOVIES.